A large cemetery in the north of Croatia's capital city Zagreb. Considered one of the best landmarks of the city and, some claim, one of the most magnificent cemeteries in Europe, it is a must-see for any dark tourist coming to these parts. More background info: The plot of land that the cemetery occupies was bought up by the city of Zagreb in 1872, and the cemetery was inaugurated in 1876. Construction of the iconic arcades and entrance as well as the main church began in 1879. For this the German architect Hermann Bollé was hired, who had just relocated to Croatia (he was born in Cologne, studied in Vienna and before coming to Croatia lived in Italy). 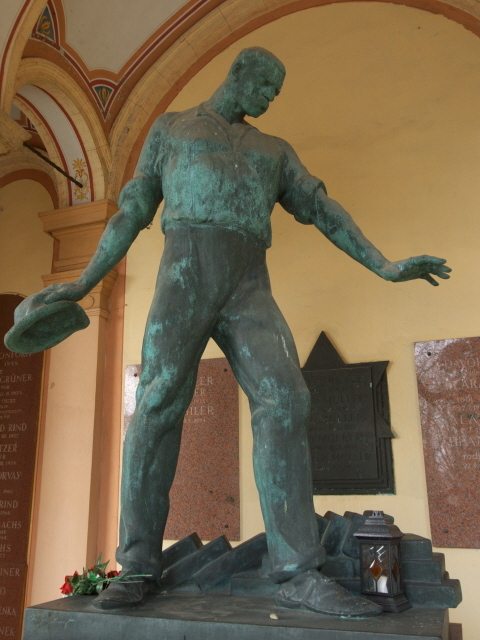 Bollé's is also known for his work on the restoration of the cathedral of Zagreb after it sustained major damage in the 1880 Zagreb earthquake. 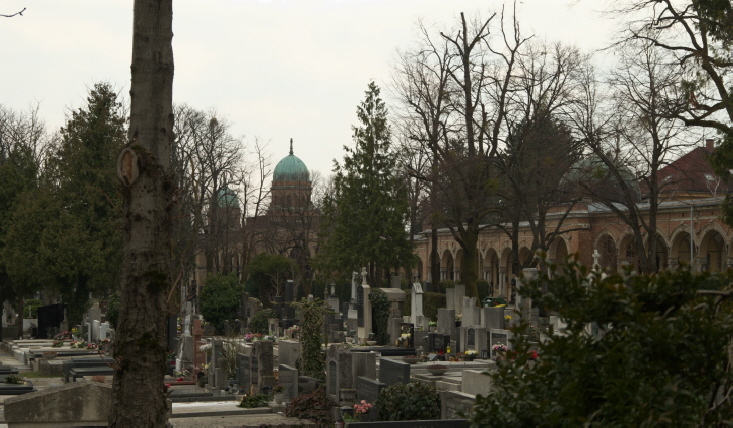 Work on the cemetery was slow going, though, and continued right until Bollé's death in 1926 (he's buried at Mirogoj), only to be finally completed in 1929. As a municipal cemetery Mirogoj is supra-denominational and so graves for people of all religions (or none at all) can be found here. 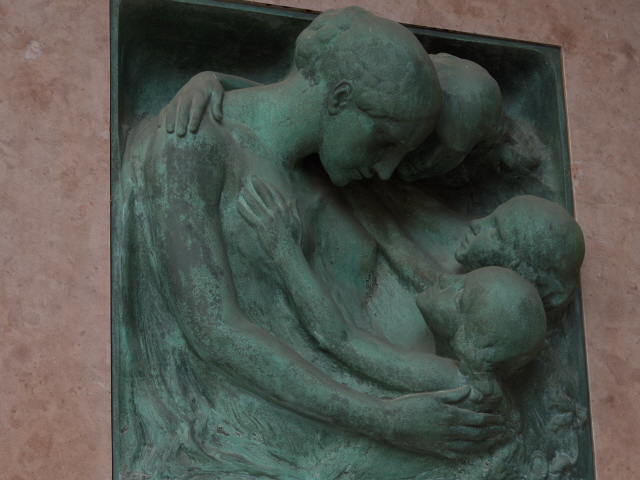 In total some 300,000 people are said to be buried at Mirogoj. 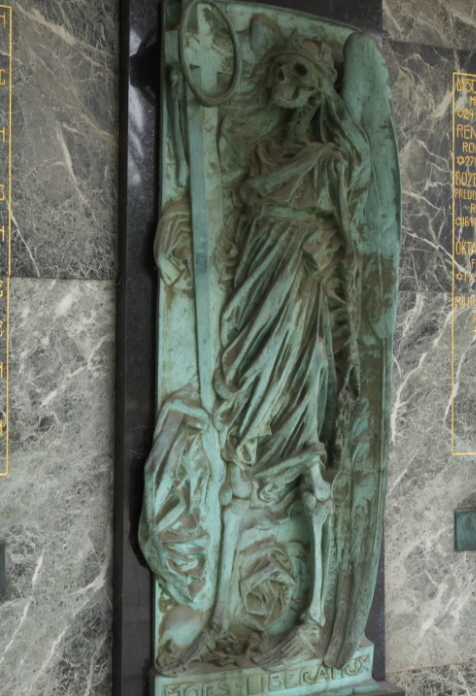 It also has its share of famous people interred here, though most of these will only be so well known to Croatians, perhaps with the most notable exception being independent Croatia's first president, Franjo Tudjman. What there is to see: The first thing that is striking about this cemetery is apparent even before you enter it: the massive western walls, made of brick and looking like a fortress's, and studded with little domes/cupolas every 130 feet (40 metres), 18 in total. At the main entrance is also the main cemetery church (Catholic) with a huge copper-green dome. Just behind the church is the monumental grave of perhaps Croatia's most famous person interred here (at least as far as modern Croatia is concerned): that of Independent Croatia's first president Franjo Tudjman. It's a massive black-marble affair with gold letters. 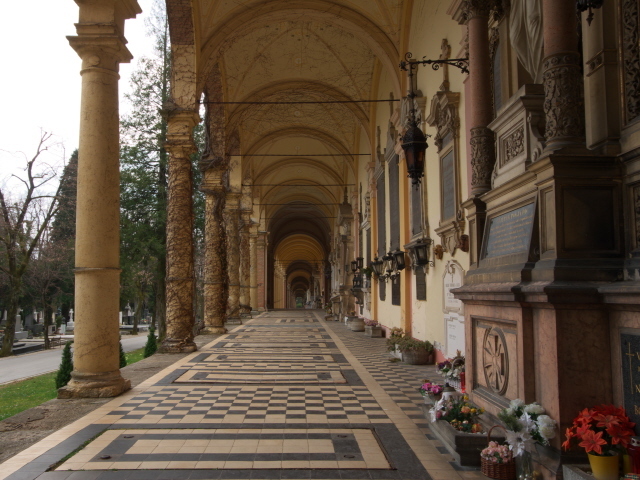 The most unique feature of Mirogoj Cemetery are those arcades inside the western wall. 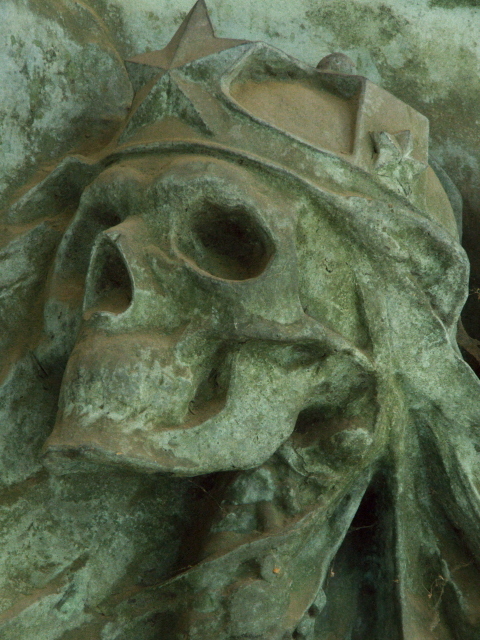 Loads of highly interesting examples of sepulchral art can be found here. Just keep your eyes open (some examples can be seen in the photo gallery below). Outside the arcades yet more interesting tombstones and sculptures/monuments can be found, especially in the older parts of the cemetery east of the arcades and the main entrance. At the end of the central avenue leading east from the main entrance and church, there are a couple of war memorials, including one for the victims of WW1. En route I also spotted a French WW1 memorial. 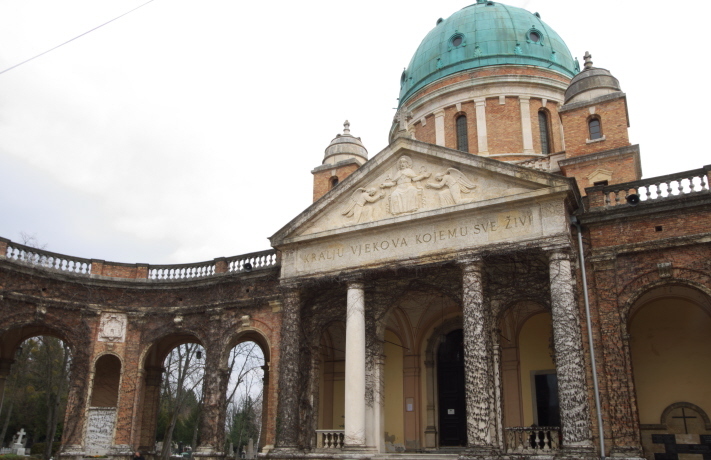 The grandest monument at Mirogoj stands just to the north-west of the northern end of the arcades. It's a construction of black marble slabs, forming a structure the size of a small house, with countless names engraved in them. In the centre of the front section burns an eternal flame. 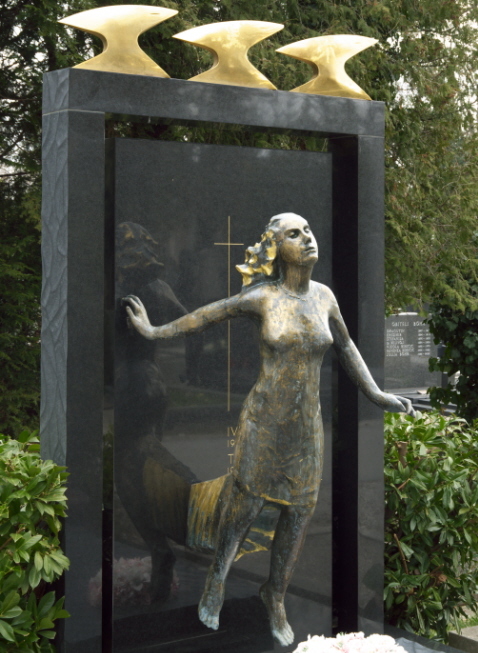 This is the main monument for the victims of the Homeland War (i.e. Croatian War of Independence 1991-1995 – see under Croatia). Just to the north-east of this is an old Yugoslav-era monument, clearly marked with the Yugoslav five-point star and hammer-and-sickle symbol on an impression of a waving flag in stone. This is the so-called Tomb of the People's Heroes, dating back to 1968. Near this yet more “political” graves/memorial stones can be found, such as one that has the Croatian words for “fascist” and “terror” in, so it's probably for victims of the Ustashe (see under Croatia and Villa Rebar). 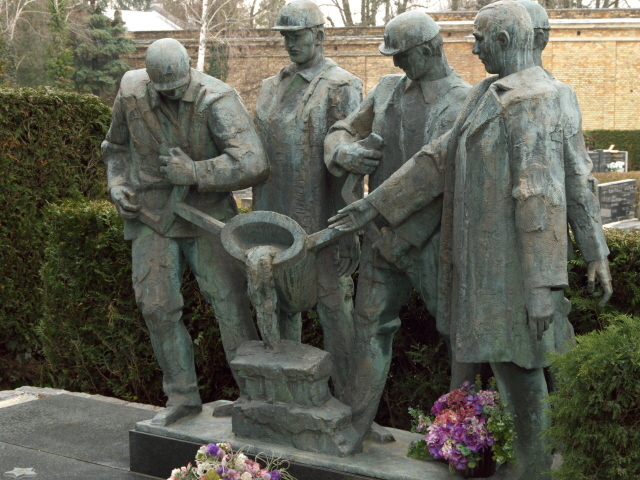 Partisans and workers get their share of glorification elsewhere, but the most unexpected and most moving discovery I made at Mirogoj was a memorial grave for some of the victims of the plane crash at Zagreb on 10 September 1976. The English inscription and British names listed caught my eye. Back home I did some research and found that these were eight of the 176 dead in total who perished in what was the worst aviation disaster in Croatia ever, and at the time the deadliest mid-air collision accident. It involved a British Airways Trident en route to Istanbul and a Yugoslav DC-9 en route to Germany. There were no survivors. The cause of the crash high above the land near Zagreb was an air-traffic controller's error, for which, however, old equipment and extreme stress due to serious under-staffing were partly to blame as well (with one controller doing the work of three at the time). The rest of the cemetery has a wide mix of sepulchral art, from bizarre Jesus figures to solemn angel figures, some concrete objects depicted are probably references to the deceased persons' jobs/careers, be it as a basketball player, a violin maker or a fighter pilot (MiG-21). The majority of graves, however, aren't especially remarkable. One common element I found on quite a large number of tombstones were double figurines of white doves, one upright and one lying dead on its side … this must be a local speciality. I hadn't seen that anywhere else before. In addition to regular graves there are also a couple of larger mausoleums (one in the shape of a pyramid! ), but not that many, really, compared to other famous cemeteries (e.g. 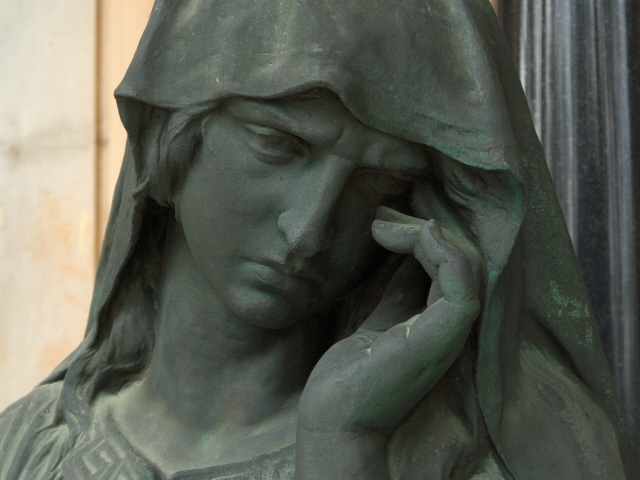 Pere Lachaise in Paris or Vienna's Central Cemetery). 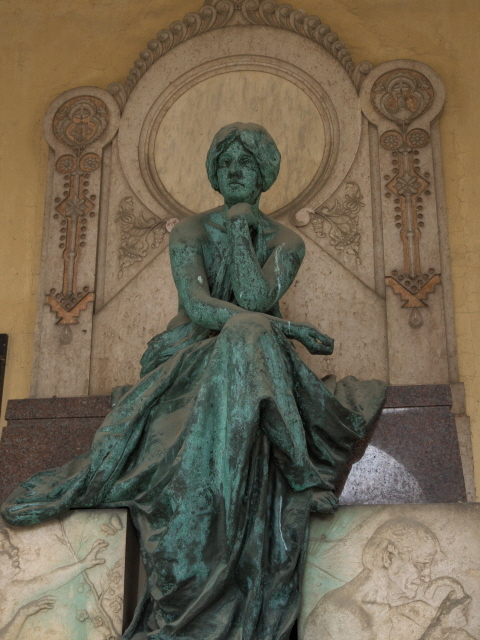 All in all, I found Mirogoj an engaging place to visit, though the really fascinating details and exuberant examples of sepulchral art are quite a bit thinner on the ground here than at, say, Milan's Monumentale, London's Highgate, or the fabled Pere Lachaise. 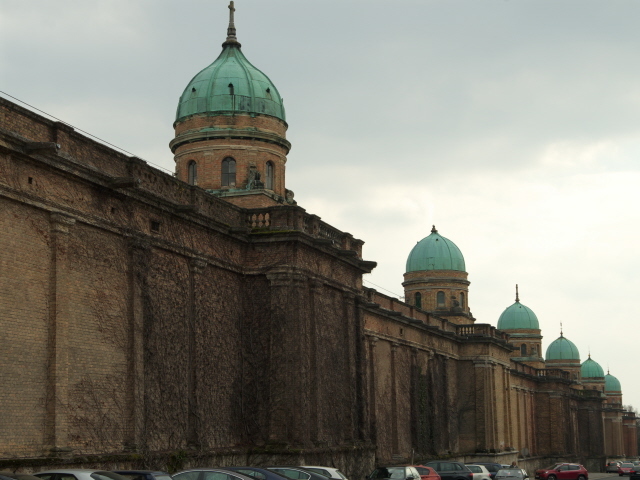 What sets Mirogoj apart more than anything, however, are those unique arcades with their domes atop that enormous outer wall. So, it's definitely worth seeing, though I'm a bit hesitant in agreeing that this is “one of the the most beautiful cemeteries in Europe” (as claimed, for instance, in the In Your Pocket guide to Zagreb). 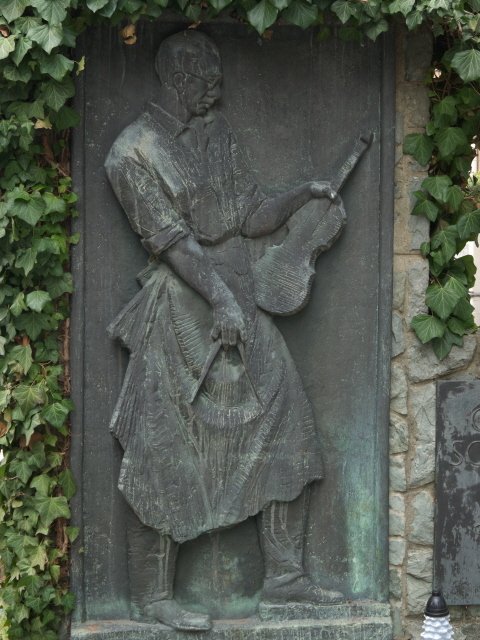 Location: to the north of the city centre of Zagreb, Croatia, the main cemetery entrance is ca. 1.6 miles (2.5 km) from the main square. Details: To get to the cemetery from the centre of Zagreb you can take bus line 106 that departs from the bottom of Kaptol ul. just outside the cathedral in the heart of the Old Town. It's a 7 minute ride departing ca. every 15 minutes towards Krematorij. That terminus is at the far end of the cemetery, but if you want to head straight for the main entrance get out at the stop Mirogoj, 6 stops from Kaptol. (The less frequent line 226 also goes there but carries on further east.) If you feel up for it, you can also walk it. From Kaptol the hike takes ca. 30 minutes, but is partly uphill. The cemetery is open from 6 a.m. to 8 p.m. between April and October, and from 7:30 a.m. to 6 p.m. between November and March. Time required: depends, if you're really into exploring cemeteries you could probably spend all day here. I made do with just two to three hours. 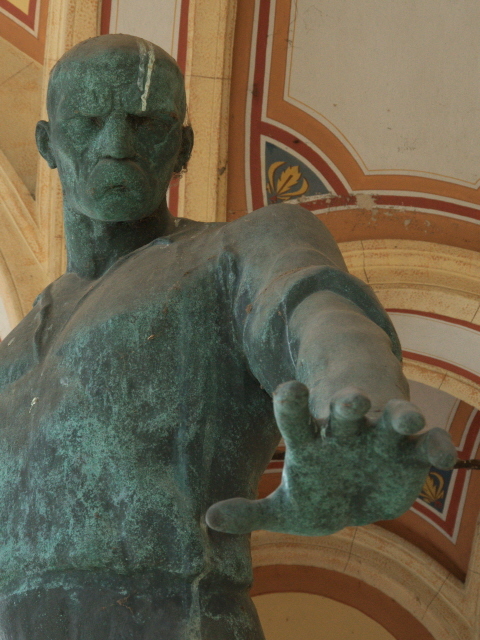 Combinations with other dark destinations: see under Zagreb. Combinations with non-dark destinations: see under Zagreb.